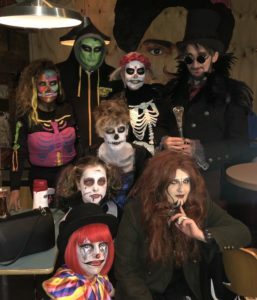 Halloween and Brazilian carnival came together for a night of flair, dancing and scary outfits as the annual Halloween parade ‘Nightmare on Bold Street’ took to the streets. Brought together by non-profit drumming group Katumba, the hundred-strong ensemble of dancers, drummers and light performers dressed in a variety of costumes dazzled the crowds as they travelled from Bold Street down into Liverpool One. Co-director of the group, Juliana Landim, who was born in Brazil, told JMU Journalism that she looks to bring an element of the country’s famous carnival to the streets of Liverpool. The parade is the group’s third since forming in 2015 and Miss Landim said: “It is one of our biggest parades of the year. It has become tradition for us. Miss Landim formed Katumba alongside Ritchie Tunstall, the group’s musical director, with the aim of “bringing the community together through music and drumming”. The group offers a huge amount to the community through workshops, education and their own health and well-being project ‘Beat It’, alongside Liverpool Mental Health Consortium.